January is the time to eat right and get fit. Forget the faddy diets and uninspiring work outs, it’s time to try something new. Find out more about Radio Taiso with Japan Centre, and see how you can have fun and get fit at the same time. One of the first things you’ll notice when you visit Japan is the large amounts of senior citizens. Then you’ll notice that almost all of these wrinkled charmers are far more sprightly than our golden oldies. By and large they’re flexible and energetic folk. So what’s the secret to their immortal enthusiasm? We think Radio Taiso may have something to do with it. As you can see, it is a gentle yet invigorating exercise routine. Played everyday at 06.30 AM on public NHK radio, Radio Taiso (pronounced rajio taiso in Japanese) is a series of prescribed exercises for group consumption, set to the pitter patter of piano keys. The numerous instructions herald from an encouraging male voice, like a friendly uncle committed to keeping the family as fit as a fiddle. There are three routines: one to increase strength, another that is suitable for all ages and a further for the elderly or disabled which can be completed whilst seated. A stupendous 20% of the country is said participate in radio calisthenics on a regular basis. No wonder Japanese are generally slimmer and healthier than their Western counterparts. The origins of this practice can be traced to 1920s America, where the Metropolitan Life Insurance Co. sponsored 15 minute exercise transmissions. These didn’t catch on in the land of drive-thru’s and food portions the size of Nigeria, but it just so happened a couple of life insurance chaps from Japan’s Ministry of Communications and Transportation were there to witness it. They were so enamoured by the idea that they brought it back to their homeland, where frankly it took off a storm. First broadcast in 1928 in line with the coronation of Emperor Hirohito, it flourished in the Land of the Rising Sun, with countless millions taking part since its conception. The seemingly innocent Radio Taiso has not been without its controversies however. During the war, the Imperial Aid Association utilised it to limber up its soldiers and keep them fighting fit, as well as introducing it in occupied countries. It was briefly suspended after Japan’s surrender in WWII, with a new version emerging in the 1950s. Tetsuro Tanaka, a one-time engineer, felt his individuality was being stifled by Radio Taiso and refused to join in the morning exercises at his firm, resulting in the termination of his job. Every day since he trots down to his former employees and sings a song of protest on his guitar- for 30 years and counting! It’s not all doom and gloom though. 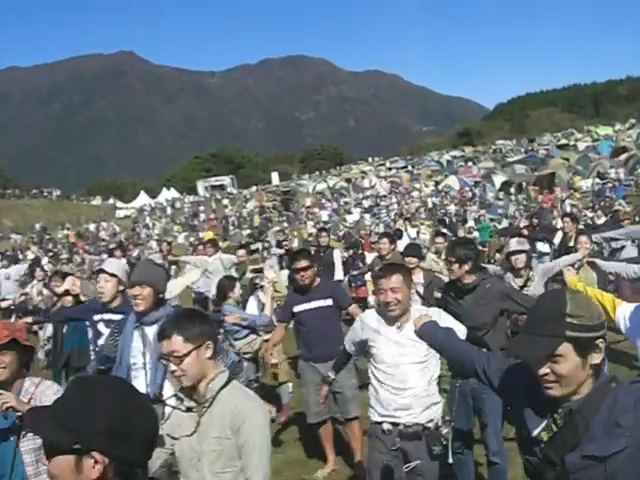 Many participants in Radio Taiso enjoy a sense of group unity, increased flexibility and the health benefits of non strenuous morning exercises. Take it from us, participating en masse in these exercises can be terrific fun, as those who went along to the Japan Matsuri in Trafalgar Square may be able to testify. Furthermore, gentle exercise in the morning can get the blood flowing around your body, energising you, loosening your joins and getting rid of stiffness. Whilst almost everyone in Japan knows the Radio Taiso routine, these days it’s mostly the sprightly elderly and youthful students who take part in Radio Taiso on a regular basis. 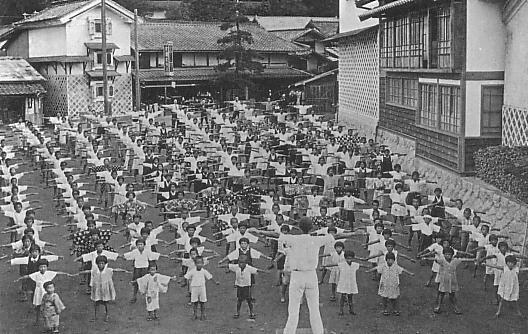 Elementary school students are encouraged to join in the fun during the summer holidays, collecting a stamp each time they complete the regime, whilst older students take part in Radio Taiso before P.E. class and sports days. In rural places though, it’s not uncommon to see the whole spectrum of the community taking part, from the least stable toddler to the least stable obaachan (Grandma). Interestingly, it has enjoyed a recent resurgence in popularity from dieters wanting to keep fit and stay trim, after being celebrated for its health benefits by athletic doctor Dr. Kakko Nakamura, who wrote a book and even made a DVD demonstrating Radio Taiso exercises. Want to get into shape this January? By following our detox blogs you can eat right, but how about trying Radio Taiso exercises daily for one month and seeing how you feel? We reckon you’ll definitely notice the benefits – more alert at work, better well being and flexibility and you may even feel slimmer. You can enjoy Radio Taiso in the comfort of your own room, but it’s so much more fun in a group. How about getting the whole office into it? We’d love to see you and your colleagues/friends/family giving Radio Taiso your all. Film your Radio Taiso adventure and post it to us on Twitter or Instagram using #RadioTaisoChallenge! Don’t forget, here at Japan Centre, we have an abundance of healthy food and brand new recipes perfect for detoxing! Combine it with the #RadioTaisoChallenge, let’s get 2015 off to a healthy start. Posted in Uncategorized and tagged january detox, japan, japanese, Radio callisthenics, radio taiso. Bookmark the permalink.